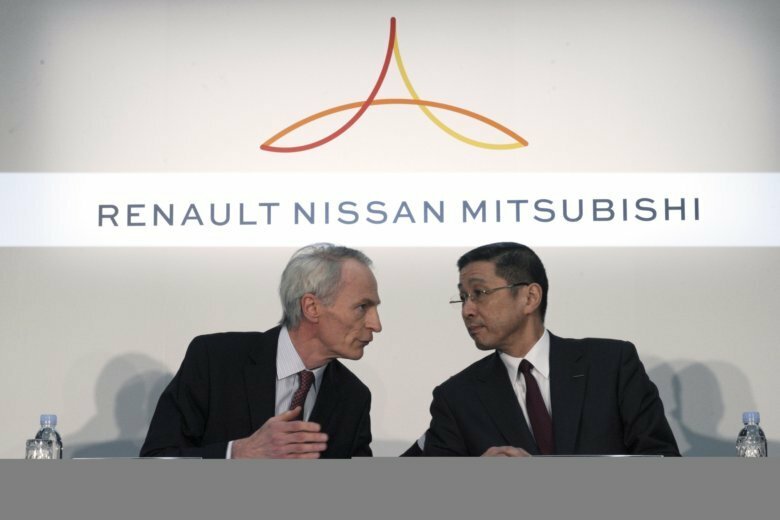 YOKOHAMA, Japan (AP) — The chief executives of Renault, Nissan and Mitsubishi have announced a new board to oversee the French-Japanese auto alliance, seeking a “new start” for the partnership after the arrest and dismissal of Nissan’s former chairman, Carlos Ghosn. “This is a very special day for the alliance,” Renault SA’s chairman, Jean-Dominique Senard, told reporters after a meeting at Nissan’s Yokohama headquarters. He spoke to reporters along with Renault’s chief executive, Thierry Bollore; Nissan CEO Hiroto Saikawa and Osamu Masuko, CEO of the smaller Japanese alliance partner Mitsubishi Motors Corp. The alliance did not announce any changes in mutual stake holdings. The new board, consisting of those four executives, will meet every month in Paris or Tokyo and oversee various projects, helping to make the companies’ operations more efficient, they said. Ghosn still is one of eight members of Nissan’s board. He had asked to attend the board meeting but was conspicuously absent after the Tokyo District Court rejected his request on Monday. When questioned about Ghosn’s case, Senard said he believed that people are presumed innocent until proven otherwise. He declined comment on whether Ghosn, who remains on Renault’s board, will be allowed to attend its meetings even if he is able to leave Japan. At the moment, as he awaits trial, he is barred from leaving the country. Doubts over the balance of power between Renault and Nissan had been growing after Ghosn’s departure. Since Ghosn’s release, he has been seen in Tokyo on outings with his family. He released a statement reasserting his innocence and calling his detention a “terrible ordeal,” but has not commented since. A statement released on Ghosn’s behalf expressed disappointment over his inability to attend Tuesday’s meeting. “As an elected member of the board, Mr. Ghosn stands ready to fulfill his professional duties to the shareholders who elected him,” it said.